Biotium’s EverBrite™ mounting medium is a revolutionary antifade mounting medium optimally formulated for preserving fluorescence of our CF® dyes and other fluorochromes for your immunofluorescence (IF) imaging applications. 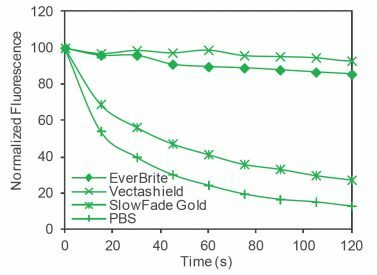 EverBrite™ provides a high level of protection from photobleaching to prolong fluorescence over a wide range of wavelengths. EverBrite™ Mounting Medium has a refractive index of 1.46, which is well-matched to the refractive indices of coverslip glass and immersion oil (1.5). 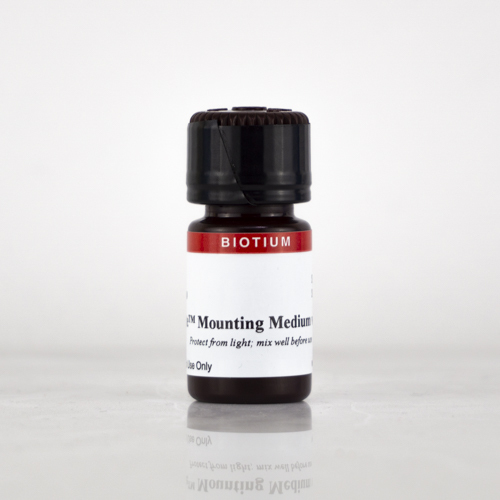 The mounting medium remains liquid and permits immediate imaging of slides and tissues after sealing the cover slip edges with nail polish or Biotium’s CoverGrip™ Coverslip Sealant. After sealing, the slides can be stored at 4°C for a year or longer. EverBrite is available with or without DAPI for nuclear counterstaining. Unlike VectaShield®, EverBrite™ is compatible with cyanine-based fluorophores like Cy® dyes. We also offer EverBrite™ Hardset Mounting Media with or without DAPI. Also see our other accessory products for cell biology research. Photostability of FITC staining in HeLa cells with various mounting media. 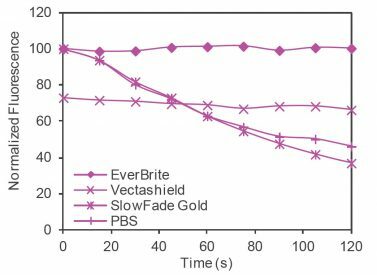 EverBrite™ Mounting Medium prolongs FITC fluorescence significantly when compared with SlowFade® Gold Antifade Mountant (Thermo Fisher Scientific). Photostability of Cy®5 staining in HeLa cells with various mounting media. 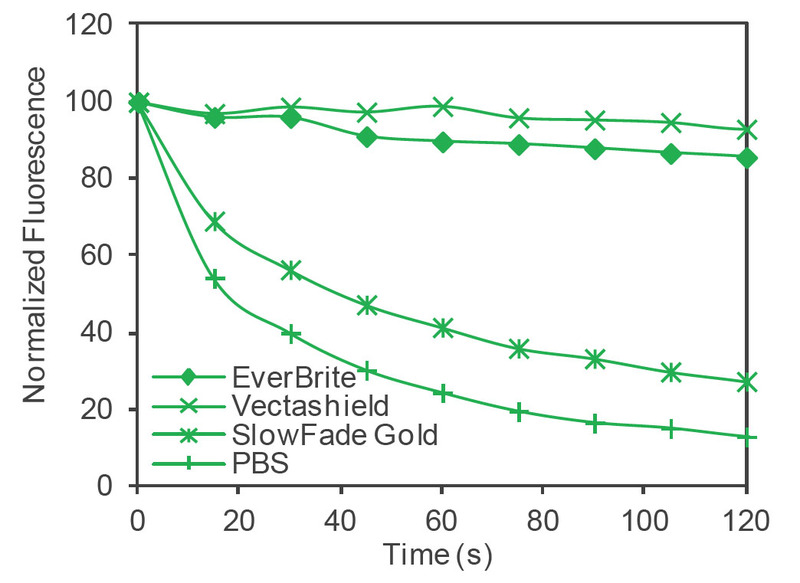 A major advantage of EverBrite™ mounting medium is that, unlike Vectashield®, it does not decrease the fluorescence of cyanine-based fluorophores. 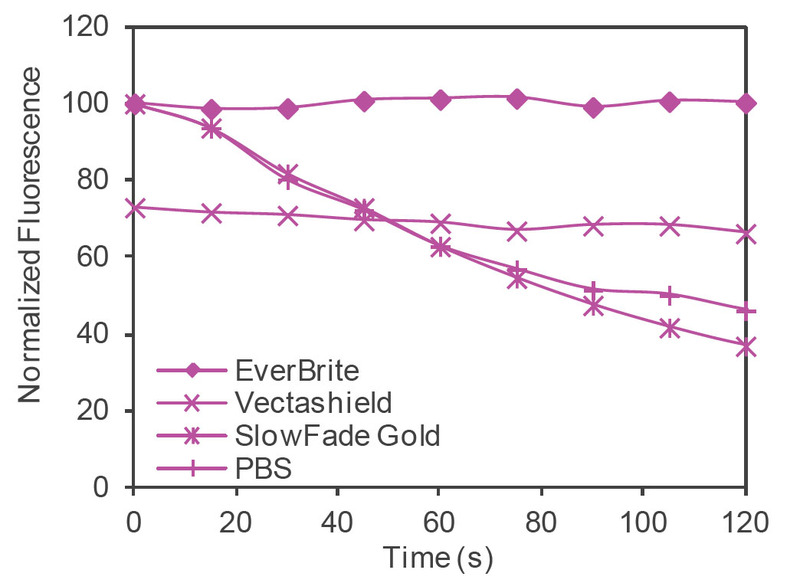 Fluorescence values for Cy®5 in Vectashield® media are normalized to PBS time t0 to illustrate the drop in fluorescence of cyanine dyes caused by Vectashield®. VectaShield is a registered trademark of Vector Laboratories. Cy Dye is a registered trademark of GE Healthcare. 1.Neurobiology of Aging (2017), doi: 10.1016/j.neurobiolaging.2017.03.005.